But his opponents and a transportation industry expert see sobering challenges, not just business opportunities as the ice cap melts and Arctic shipping lanes open. AUGUSTA — Global warming could help Maine because the melting of the Arctic icecap has opened northern shipping lanes, Gov. Paul LePage told attendees Thursday at a conference on the future of the transportation industry. The comments, part of his opening remarks for the conference at the Augusta Civic Center, were similar to points made by Icelandic President Olafur Ragnar Grimsson in May at an international trade conference in South Portland. Grimsson said the polar shipping route would shorten the trip between China and Europe by 40 percent to 50 percent. Maine could be part of the route because, earlier this year, Icelandic shipping company Eimskip made Portland its only U.S. port of call. LePage said recent years have been difficult for the construction industry as it relates to transportation projects, but he thinks the state has turned a corner. “I think with Eimskip coming to Maine, with all the good things happening – it used to be global warming; I think they call it climate change now – but there are a lot of opportunities that are developing,” LePage said. Democrats, including one of LePage’s top gubernatorial challengers next November, criticized the comment, claiming LePage was ignoring the negative effects of climate change. U.S. Rep. Mike Michaud’s campaign manager sent an email to supporters Thursday afternoon asking them to donate to the congressman’s gubernatorial campaign and touting Michaud’s endorsement last month from the Sierra Club. House Majority Leader Seth Berry, D-Bowdoinham, said the governor is looking at only the aspects of climate change that fit his ideology. He criticized LePage for vetoing a bill last session that would have created a climate change study. “My concern is the governor appears to be grasping at theoretical benefits when he’s sticking his head in the sand around the real challenges that lie ahead of us,” Berry said. Brent Littlefield, a senior advisor for LePage, said the governor wasn’t making a statement about environment policy. He pointed out that the Icelandic president made similar comments and emphasized the governor’s role in recruiting Eimskip to Portland. LePage’s other opponent in a likely three-way race for governor took the opportunity to set himself apart from both LePage and Michaud. Eliot Cutler, an independent candidate who narrowly lost to LePage in 2010, said in a statement released Thursday that his opponents were half-right and half-wrong about the issue. 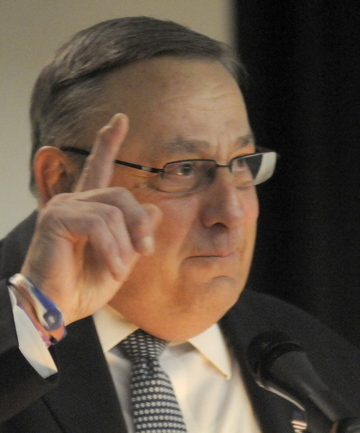 He derided LePage for not acknowledging climate change as “the greatest environmental challenge of our time” and not taking more aggressive action to reduce carbon emissions, while saying Michaud should acknowledge that it’s too late to change the fact that Eastport will soon become the closest U.S. port to Europe and China. The conference’s keynote speaker, Cynthia Burbank also addressed the effect of climate change on transportation systems. Burbank is vice president of Parsons Brinckerhoff, a New York-based engineering and design firm, and a former administrator at the U.S. Department of Transportation. She said she was initially skeptical about climate change, but she now believes it poses an extraordinary risk to the transportation systems and the entire world.